Thank you for the support you offered to Canyon Concert Ballet as one of the professional dancers. Your graciousness in finding time to work with me on short noticeand your patience with me as a student were "above and beyond". I had more fun that I can expresseven though I was probably as nervous as I've ever been. You were a wonderful dance teacher and partner. Thank you for keeping me moving and covering up my mistakes. Our audience was very appreciative. I really had funbut I wanted "do overs" when we'd finished dancing. It was a great experienceand a personal growth opportunity for me. Thank you. I want to personally thank you for a wonderful evening. Everyone who attended the Har Shalom salsa lesson and dance last night had a wonderful time, including me and Herb. We practiced several times today! . . . Thanks again and we'll be seeing you soon as we plan to sign up for more lessons. Thank you for all of your efforts. Everyone we talked to felt the party was a huge success and they had a wonderful time. We also got rave reviews about the swing dance lessons and how they were grateful that we had the lessons, since they would have been lost without them. Many also commented that your teaching style added more class and interest to the dance. Thanks again. "You are very welcome! Yes, both Kevin and I heard lots of positive comments, as well. The dancing was a huge hit and made the whole program 'come alive!' I hope we have a chance to work together again some time." It was truly our joy and pleasure to have you, your wife, and your dancers as part of our program! We have had nothing but positive feedback from it! People at church yesterday morning were all still 'buzzing' about how much they enjoyed it! THANK YOU!! We so enjoyed the evening and having you with us. Hopefully you'll get some business off the event and hopefully we can do another event in the future. So many of the Rotarians came up to me after and said they had a wonderful time. You are to be commended for being such a great teacher!!! Thanks. Candace Mayo, Executive Director of Fort Collins Habitat for Humanity, Inc. Thanks, Dave. We had a great time, and we also have a smiling high-school senior who loved her graduation party! Thanks soooo much to you and Sarah for doing the demo today. The kids were so spellbound. I NEVER see them that quiet! I was thinking about how one event like that can change someone's lifesomeday one of those kids will be dancing and they will be asked 'Why did you start dancing?' and they will say: 'Well, in 6th grade this amazing dance pair came to my school and. . .' Or, it could be just the dance for the sake of dancing and making-life-better kind of thing. Anyway, thanks for doing such a great job with both the history and the dances. Dancer Guy will be happy to host your event at his studio and instruct your guests in the fine art of dancing. Dave (and a co-instructor, if you wish) will adjust the level of teaching as needed, so if your group has no experience with dance and is starting from ground zero, Dancer Guy will gladly accommodate them. Or, if your group is already familiar with dancing, and just needs some polish, wants to learn some fancy moves, or simply needs a "dance facilitator," that's fine too! 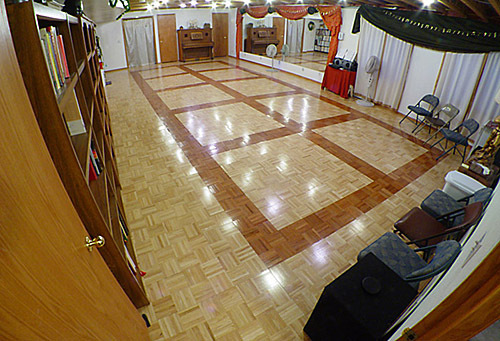 DancerGuy's studio is a large, well-lit, air-conditioned room with a wood floor, mirrors on two walls, and a substantial sound system. It can handle groups of up to 25 or 30 people. Assuming the event is three hours long (which is typical), there is first a lesson time, approximately two hours long, to train people in the first few moves of whichever dance style you've chosen. Two hours is a good amount of time: if the training time is too short, too few moves are learned, and then during the open dancing time that follows, people get bored doing the same few moves over and over again. If the lesson time is much more than two hours, people's brains get full and they can't learn any more. There is an open dancing time, about one hour, to practice the moves that the people just learned. During this time, guys can ask girls to dance, and girls can ask guys to dance; either way is fine. They will typically practice the moves that they just learned, but if they know other moves as well, that were not taught in the lesson time, they can throw those in too, to make their dance more interesting, varied, and enjoyable. DancerGuy (and co-instructor, if you requested one) will dance with whomever wants to dance with them, and show them new moves, answer any questions, and so forth, during the entire open dancing time. Although the above is what typically happens at an event in DancerGuy's studio, we can certainly deviate from the description above if you so desire. Contact DancerGuy at (970) 207-9176 to talk over your ideas, and he will do his best to accomodate you. At events in DancerGuy's studio, another option is to have DancerGuy provide snacks for your group. Snacks could include cookies of various kinds, candy of various kinds, crackers and cheese (both of various kinds), a fruit tray, a veggie tray with dip, nuts, and non-alcoholic drinks such as ice water, unsweetened tea, various kinds of juice, and coffee (regular and decaf). How much the snacks would cost depends on which ones you choose. Glasses, ice, paper plates, and napkins are also provided. If you are interested in Dancer Guy hosting your event at his studio, contact Dave ( dave@DancerGuy.com or 970-207-9176) for availability and prices. The total cost is based on the number of people being taught, the number of instructors you request, and the duration of the event, and the snacks requested.